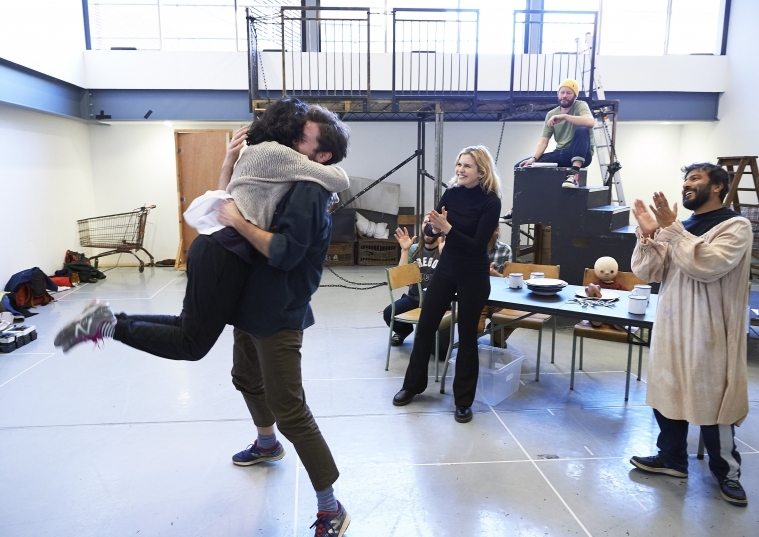 With their rehearsal journey well underway, we can almost feel the festive joy seeping through our Rehearsal Room doors. Here we find out all the goings on from Week 3 of A Christmas Carol with Assistant Director Charissa Martinkauppi. While much of last week was dedicated to the supernatural, this week has primarily been centred on the living. The main focus of rehearsals so far has been on the haunting of Scrooge and the words of warning his old business partner Jacob Marley, played by Neil Haigh, gives him from the other side. This crucial message is predominantly expressed through music, and though doomed to an eternity of agony, the ghost of Jacob Marley has been blessed with one catchy song. In fact, all the songs I have heard so far in this production have been incredibly catchy, and I can’t seem to get them out of my head! These past few days the sounds of rattling chains and moaning ghosts have gradually been replaced by more cheerful tunes and a deeper dive into the psyches of the play’s characters. With the introduction of the Ghost of Christmas Past, we return to table work in order to further examine characters from Scrooge’s childhood and youth and what influence they had on our main character becoming the greedy, callous ogre we find him to be in the first scenes of the play. This analytic work finds the cast and director bouncing questions, interpretations, and plenty of jokes, back and forth in order to communally construct these characters and their world. It’s incredible to discover that such a familiar tale can provide so many new understandings and puzzling questions! Each discussion seems to add another layer to the story and I find myself sympathising with all the characters in a way I previously never have. Scrooge is not the only character to have his family life studied this week, as a visit from British Sign Language consultant Deepa Shastri allowed us to jump forward in the story to take a look at the Cratchit family . As mentioned in last week’s entry, Bob Cratchit is portrayed by a Deaf actor, which has resulted in a large part of the cast learning lines in BSL. The sessions with Deepa proved to be a challenging, but very lively and enjoyable experience for the cast and gave us all great insight into the workings of British Sign Language. This work also gave us a sneak peak of the Ghost of Christmas Present, and seeing what new complexities and nuances the Ghost of Christmas Past has brought leaves me impatient to see what it, and the next week, will bring! A BSL consultant corrects the translation of the written English into BSL and makes sure the signing is done clearly and correctly. Their work can be compared with that of a voice or dialect coach.